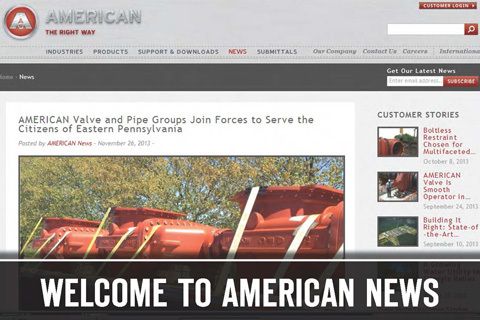 AMERICAN Cast Iron Pipe Company recently unveiled its new online News Center, designed to be media’s and customers’ go-to source for: the latest in industry trends, product development and manufacturing news; how AMERICAN’s products are solving customers’ tough challenges; and a look inside AMERICAN – our products, our people, our way. The redesigned and interactive News Center contains customer stories, web videos, company announcements and more. The News Center also has simple share buttons attached to each story so readers can share, or “like” what they’ve read on Facebook, Twitter or LinkedIn. The News Center also allows readers to subscribe by email to receive the latest updates from AMERICAN. To receive news you can use from AMERICAN, follow the steps below. Step 2: Enter your email address into the “Subscribe” box at the top, right of the page. Step 3: You will receive a confirmation email from AMERICAN News, news@american-usa.com, with the subject line “Confirm your subscription request.” Click on the link in the email to confirm your subscription. Founded in 1905 in Birmingham, Ala., AMERICAN is a manufacturer of ductile iron pipe, spiral-welded steel pipe, fire hydrants and valves for the waterworks industry and electric-resistance-welded steel pipe for the oil and natural gas industries. AMERICAN’s diversified product line also includes static castings and fire pumps.